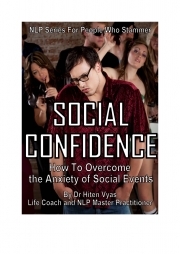 Description of "Social Confidence (eBook)"
Are you a person who stammers (stutters) who experiences anxiety and fear about going into social situations? Do you worry about being rejected or criticised in social gatherings because of your stammering, which makes you avoid them? Do you feel awkward when you're in social situations and are unsure of how to behave? Learn how to transform your internal self-talk to help increase your confidence to go into social situations. Learn how to change your self-image into one that is highly confident and sociable, so that you can use this new self-image to approach social situations with confidence and assertiveness. Learn how to create empowering states (e.g. confidence, optimism, assertiveness) inside you, and how to get into these states before you go into social situations, so you are feeling empowered once you enter the social situation. Learn how to get into empowering states when you are already in social situations, to help you overcome any anxiety you may experience. The eBook is full of cognitive techniques and real world exercises to help you become socially confident. Dr Hiten Vyas is the founder of Stuttering Hub Limited, a UK-based life coaching company. He is an NLP Master Practitioner, trained in the United States and uses NLP in his coaching practice. Reviews of "Social Confidence (eBook)"